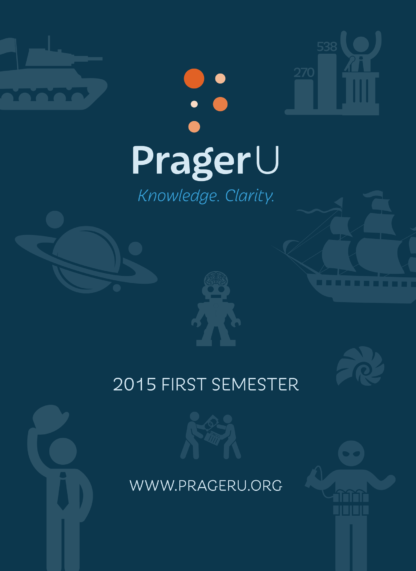 The 2015 “First Semester DVD” is a collection of 25 courses from the first 6 months of 2015. Here at PragerU, you’ll find some of the brightest thinkers presenting their best ideas in five minutes. Arthur Brooks, Alan Dershowitz, Eric Metaxas, Chloe Valdary, Tara Ross, and Nick Adams are just a few of the acclaimed thinkers whose free, 5-minute videos are available to you anytime you need them. 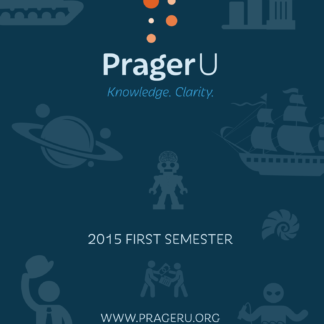 Prager U DVDs would make a thoughtful birthday or holiday gift, a fantastic graduation gift, or a fine addition to your own DVD collection. On this Prager U DVD, you will find some of the brightest thinkers presenting their best ideas in 5 minutes. Is Israel’s policy of building civilian communities in the West Bank the reason there’s no peace agreement with the Palestinians? Or would there still be no peace even if Israel removed all of its settlements and evicted Israeli settlers, as it did in Gaza in 2005? Renowned Harvard professor and legal scholar Alan Dershowitz explains. Do the rich pay their fair share of taxes? It’s not a simple question. First of all, what do you mean by rich? And how much is fair? What are the rich, whoever they are, paying now? Is there any tax rate that would be unfair? UCLA Professor of Economics, Lee Ohanian, has some fascinating and unexpected answers. What was perhaps the most determinative date in American history? July 4, 1776? Pearl Harbor? September 11? How about…July 28, 1588. Richard McMillan, Professor of History at Pierce College, explains why that seemingly random date is so important. America’s campuses, particularly those in California, spend tens of millions of dollars on administrators and programs to combat issues like sexism, homophobia, and racism on campus. But are these problems in any way prevalent at our universities? Or is this diversity bureaucracy a big waste of money? Heather Mac Donald of the Manhattan Institute explains. Do humans have free will or are our decisions entirely products of chemistry, physics, and genetics? Is there a difference between the brain and the mind? Could a neuroscientist with enough knowledge of our brains know every decision that we’ll make? The answers to these questions cut to the heart of what it means to be human. Every year on Earth Day we learn how bad humanity’s economic development is for the health of the planet. But maybe this is the wrong message. Maybe we should instead reflect on how human progress, even use of fossil fuels, has made our environment cleaner and healthier. Alex Epstein of the Center for Industrial Progress explains. Americans today place enormous pressure on presidents to “do something”…anything, to get the economy going. There was one president, though, Calvin Coolidge, who did “nothing” — other than shrink government. What happened? America’s economy boomed. Is there a lesson to be learned? Award-winning author, historian, and biographer Amity Shlaes thinks so. Is there an equation that can accurately predict how happy you will be? There is. Can you control the inputs of that equation, and thus your own happiness? You can. How? 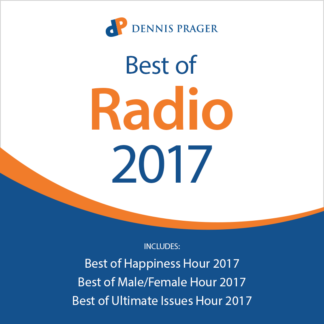 Dennis Prager, author of the best-selling book, “Happiness is a Serious Problem”, explains. Right now, there’s a well-organized, below-the-radar effort to render the Electoral College effectively useless. It’s called the National Popular Vote, and it would turn our presidential elections into a majority-rule affair. Would this be good or bad? Author, lawyer, and Electoral College expert Tara Ross explains. Should America be the world’s policeman? Does the world even need a policeman? Or would humanity be better off if America weren’t the dominant military superpower? Pulitzer Prize-winning columnist and foreign affairs expert Bret Stephens weighs in. There were thousands of college commencement speeches around the country this year for the Class of 2015. But there was one missing — one very truthful, funny and witty speech that graduates should’ve heard, but didn’t. Well, here it is, spoken by George Will, Pulitzer Prize-winning columnist at the Washington Post. Is America really that great? Or is the United States just like any other nation? Outsiders tend to be the best judge of character, and Nick Adams, a best-selling Australian author and political commentator, gives an outsider’s view of the USA.